Here are some snazzy birthday facts about 20th of November 1944 that no one tells you about. Don’t wait a minute longer and jump in using the content links below. Average read time of 10 minutes. Enjoy! What day was my birthday Nov 20, 1944? November 20, 1944 was a Monday and it was the 325th day of the year 1944. It was the 47th Monday of that year. The next time you can reuse your old 1944 calendar will be in 2028. Both calendars will be exactly the same! This is assuming you are not interested in the dates for Easter and other irregular holidays that are based on a lunisolar calendar. There are 212 days left before your next birthday. You will be 75 years old when that day comes. There have been 27,181 days from the day you were born up to today. If you’ve been sleeping 8 hours daily since birth, then you have slept a total of 9,060 days or 24.81 years. You spent 33% of your life sleeping. Since night and day always follow each other, there were precisely 921 full moons after you were born up to this day. How many of them did you see? The next full moon that you can see will be on May 18 at 21:13:00 GMT – Saturday. Fun stat: Your first one billion seconds (1,000,000,000) happened sometime on July 29, 1976. If a dog named Shieva - a Korean Jindo Dog breed, was born on the same date as you then it will be 353 dog years old today. A dog’s first human year is equal to 15 dog years. Dogs age differently depending on breed and size. When you reach the age of 6 Shieva will be 42 dog years old. From that point forward a medium-sized dog like Shieva will age 4.5 dog years for every human year. American Revolutionary War: British forces land at the Palisades and then attack Fort Lee. The Continental Army starts to retreat across New Jersey. World War I: Battle of Cambrai begins: British forces make early progress in an attack on German positions but are later pushed back. Savings and loan crisis: The United States Senate Ethics Committee issues a stern censure of California senator Alan Cranston for his “dealings” with savings-and-loan executive Charles Keating. What does my birthday November 20, 1944 mean? Your birthday numbers 11, 20, and 1944 reveal that your Life Path number is 22. It is a master number that represents practical idealism and material mastery. You were born under the most powerful and potentially the most successful of all Life Path numbers. The following celebrities also have the same life path number: Slavko Avsenik, Pinto Colvig, Sarah Radclyffe, Keiko Awaji, Cirroc Lofton, Eleonora Rossi Drago, Ann Rutherford, Caveh Zahedi, Jane Wyatt, Anne Bancroft. 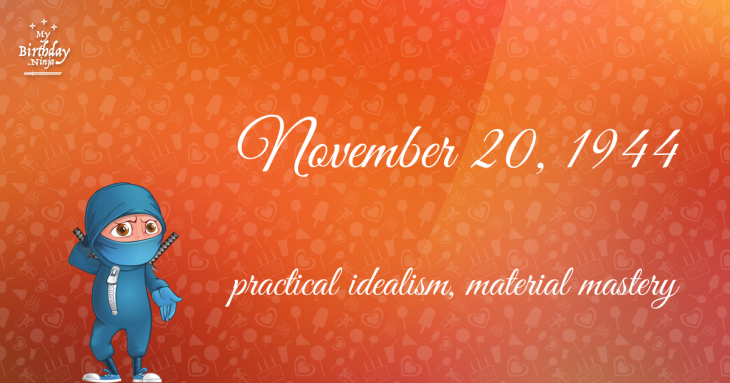 What is the birthday horoscope for Nov 20, 1944? The Western zodiac or sun sign of a person born on November 20 is Scorpio ♏ (The Scorpion) – a fixed sign with Water as Western element. The ruling planet is Pluto – the planet of transformation. According to the ancient art of Chinese astrology (or Eastern zodiac), Monkey is the mythical animal and Wood is the Eastern element of a person born on November 20, 1944. Fun fact: The birth flower for 20th November 1944 is Chrysanthemum for loveliness. What is the Love Match for Nov 20, 1944? When it comes to love and relationship, you are most compatible with a person born on January 16, 1942. You have a Love Match compatibility score of +117. Imagine being in love with your soul mate. On the negative side, you are most incompatible with a person born on February 16, 1919. Your incompatibility score is -122. You’ll be like a cat and a dog on a love-hate relationship. Arf-arf, I want to bite you. Meow-meow, stay away from me! What is the popular baby name on 20 Nov 1944? Here’s a quick list of all the fun birthday facts about November 20, 1944. Celebrities, famous birthdays, historical events, and past life were excluded. 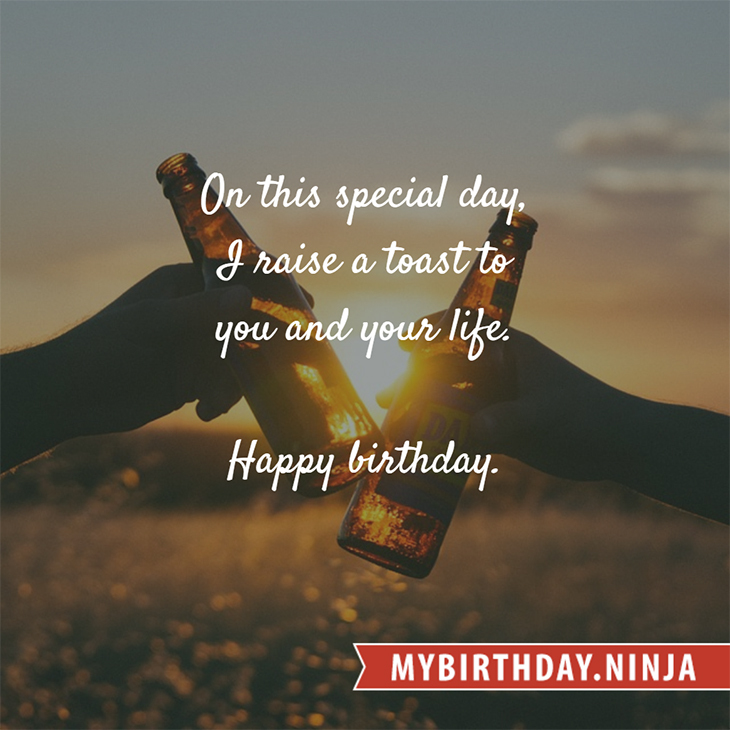 Try another birth date of someone you know or try the birthday of these celebrities: February 12, 1967 – Hermione Norris, English actress; May 3, 1973 – Brad Martin, American singer-songwriter; October 5, 1924 – Bill Dana, American actor, producer, and screenwriter.